This set of Geotechnical Engineering test focuses on “Standard Proctor Test”. Explanation: The standard proctor test was developed by R.R.Proctor in 1933 for the construction of earth fill dams in the state of California. 2. The compaction process can be accomplished by ___________ process. Explanation: Compaction can be done by rolling, tamping or vibration by a steel-tyred or rubber-tyred roller. Explanation: The compaction energy used in the proctor test is 6065 kg cm per 1000 ml of soil which is equal to 595kJ/m3. 4. Which of the following test are used in the laboratory, for compaction? Explanation: Some of the compaction tests used in the laboratory is: standard and modified proctor test, Harvard Miniature compaction test, Abbot Compaction test and Jodhpur-mini compactor test. Explanation: Air-voids line is a line which shows the water content dry density relation for the compacted soil containing a constant percentage of air voids. 6. Which of the following equipment is not used in standard compactor test? Explanation: The compactor test equipment consists of cylindrical metal mould, detachable base plate, collar, rammer of 2.5kg. Explanation: The initial water content may be taken as 4 % for coarse-grained soils and 10 % for fine-grained soils as the quantity of water to be added for the first test depends on the probable optimum water content for the soil. Explanation: The water content goes on increasing till the maximum density is reached. The water content corresponding to the maximum density is called optimum water content W0. Explanation: The modified compactor test was standardized by the American Associates of State highway officials and is known as the modified AASHO test. 10. In standard compactor test, soil is compacted into _____________ layers. Explanation: The standard compactor test consists of compacting the soil at various water contents in the mould, in three equal layers, each layer being given 25 blows from the rammer. 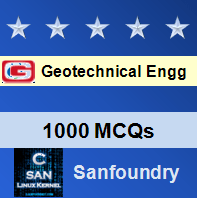 To practice all areas of Geotechnical Engineering for tests, here is complete set of 1000+ Multiple Choice Questions and Answers.